Families of children with chronic conditions face many challenges. 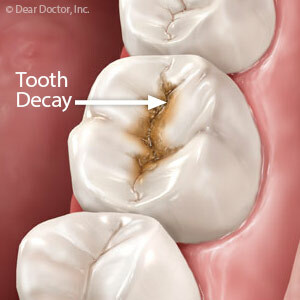 One that often takes a back seat to other pressing needs is the prevention of tooth decay. But although difficult, it still deserves caregivers’ attention because of the dental disease’s potential long-term impact on oral health. Chronically ill children are often at higher risk for tooth decay, most commonly due to challenges in practicing effective oral hygiene. Some conditions create severe physical, mental or behavioral impairments in children’s ability to brush and floss: for example, they may have a heightened gag reflex to toothpaste in their mouth or they may not be able to physically perform these tasks on their own. Some children may be taking medications that inhibit salivary flow as a side effect. Saliva is critical for disease prevention because it both neutralizes mouth acid (which can erode tooth enamel) and is a first line of defense against disease-causing bacteria. And a child’s diet, while designed to support treatment of their chronic condition, may conversely not be the best for supporting their dental health. Medication and diet changes. If medications are causing dry mouth, caregivers can speak to their physicians about possible alternatives; likewise, they should see if modifications can be made to their diet to better support dental health. Boosting salivary flow. It’s especially important with children who have dry mouth to drink more water or use aids (like xylitol gum or candies) to boost salivary flow. Although it requires extra effort and time to give attention to a chronically ill child’s dental health, it’s well worth it. By working to prevent tooth decay early in life, these children will be more likely to enjoy good dental health in the future.